Abbot Steve finished his first round of chemotherapy this past Thursday. This week he is able to take a break from chemo, and a blood test on Wednesday may help determine if the treatment is having any success in shrinking the cancer cells. He still has very little appetite, and his experience of pain is again a concern. So far it has been the case that the day after chemo has been a pretty good day. 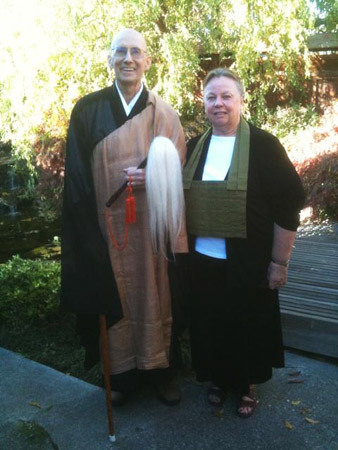 Abbot Steve took advantage of this last Friday by performing a lay entrustment ceremony with Elizabeth Sawyer, a long time sangha member. Steve Weintraub and Ken Sawyer were here as witnesses to that ceremony. Included in this post are a few pictures taken just after that ceremony. Abbot Steve is working to accept the limitations placed upon him by his decreasing energy. Every day seems to bring new challenges. He and Lane are continuously learning about pancreatic cancer and the complex situation that they find themselves in. Finally, Abbot Steve asked me to again thank all of his family, friends and sangha members who are sending greetings and who are supporting him in many diverse ways. Posted in Uncategorized on November 18, 2013 by Mary Stares. Upright people, in a beautiful setting setting, doing the good work of entrusting Dharma. Thank you all for carrying on the great Way. I feel deeply inspired and moved by all of you. I vow to remember this profound teaching and to embody it with the help of all beings. What an inspiring ceremony, and such beautiful pictures. Steve, my words only hint at deeply you are teaching me. How deeply you teach. Each post feels like a fresh breath. Each smile of yours is infinite. Hey...thanks. Elizabeth, that's a great haircut! 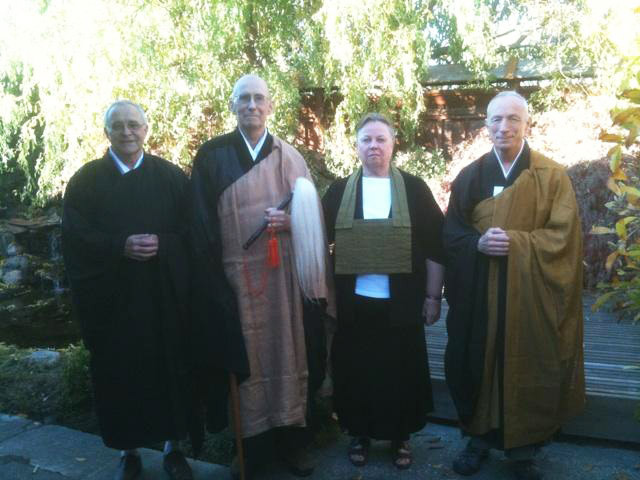 Congratulations to Abbot Steve and Elizabeth and Great Congratulations to the Sangha for our new Dharma Teacher! Elizabeth, very glad to see you in your new Rakasu. Abbot Steve, you look radiant!